My guy, show him the money. Following yesterday’s report that the 2018 NA LCS Spring Split Finals would be held in Miami, Florida, Riot made the official announcement today, and for anyone familiar with the ’80s crime drama Miami Vice, it was awesome. 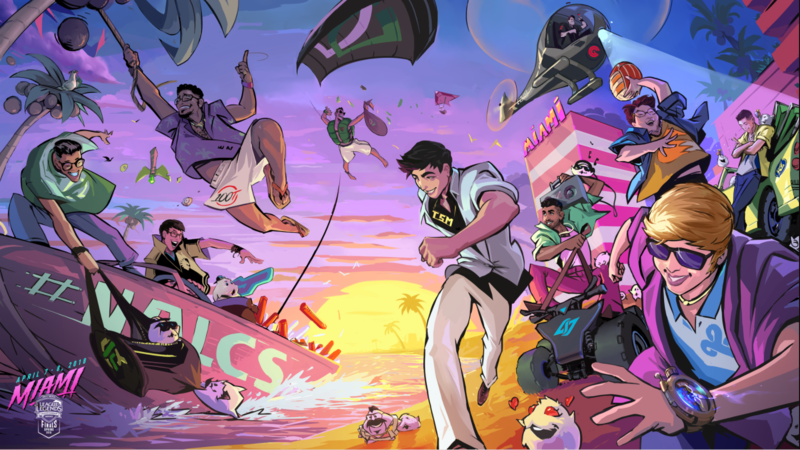 In the featured image used to celebrate the new venue, artist Christian Fell brought LCS players to life in a way we never thought possible—as sunglasses-wearing, suit-sleeves-rolled-up, purple-clad Miami Vice characters. We never knew we needed to see Kevin “Hauntzer” Yarnell wearing obnoxiously golden TSM bling and running on a beach wearing white suit paints, or Darshan Upadhyaya standing on a four-wheeler with a bright green suit and holding a boombox. But now that we’ve seen it all, we’re not sure how we managed to live life without it. We’re almost positive you’ve never seen anything like this before, because we certainly haven’t, but this isn’t Fell’s first League-related art. You may recognize his work in-game as Rek’Sai, Vel’Koz, and Wukong’s splash artwork. He’s also done some for other skins and champions, too. While we’re still a couple of months away from the April 7 start of the finals at the Jackie Gleason Theater, we’ll be content imagining how many pointed sunglasses, pink neon, and blazers will (hopefully) be present at the event.